Ever wonder why you can smell the salty ocean breeze? The notorious salty smell of the seashore is caused by the compound dimethylsulfide (DMS). However, this salty smell isn’t produced to reminds us of sandy beaches and sunny days spent swimming in the ocean. Phytoplankton or tiny plant like organisms found in the ocean are responsible for producing DMS. Phytoplankton release DMS as a byproduct when metabolizing dimethylsulfoniopropionate (DMSP) for growth. 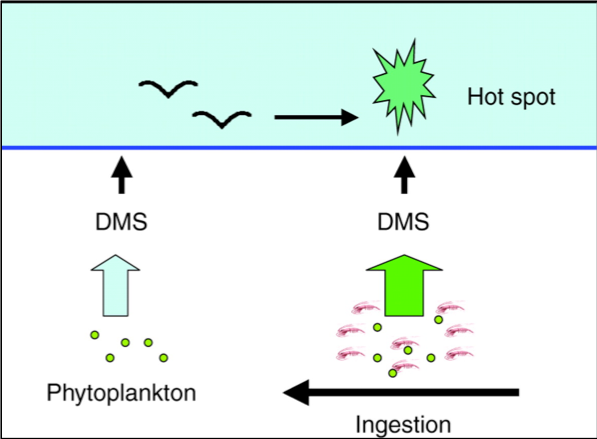 As shown in the figure below, during phytoplankton blooms the cells accumulate the DMS compound. Then, zooplankton feed on phytoplankton and the DMS compound is released causing a salty smell. While there’s still much to be learned about why phytoplankton produce this compound this compound has an important relationship with birds. Hill, R. W. and Dacey, J. W. H. (2006). Metabolism of dimethylsulfoniopropionate (DMSP) by juvenile Atlantic menhaden Brevoortia tyrannus. Mar. Ecol. Prog. Ser. 322, 239 -248. Sea birds have developed an olfactory system to respond to DMS. The sea birds can sense the DMS compound produced by phytoplankton. The smell of DMS causes birds to identify these areas as “hot spots” which are full of these small plant like organisms. Sea birds have evolved to fleet to these areas and feed on the small plankton. Aside from this salty smell signaling feeding time for sea birds DMS also has important climate impacts. DMS that is released into the air quickly gets converted into sulfate naturally. 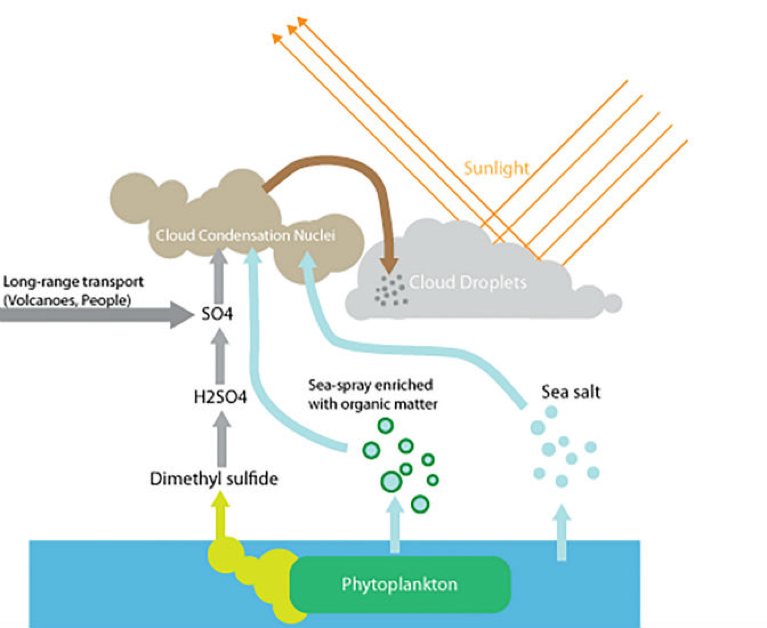 As shown in the figure below, sea spray and salts are able to surround these sulfur compounds causing an accumulation of droplets and ultimately cloud formation. Understanding how phytoplankton help to drive cloud formation is important to our understanding of climate systems. Clouds can act as cooling agents by deflecting light or they can contribute to the increasing warm temperatures of our planet by trapping heat. Work is currently underway to better understand the role of these tiny marine organisms in regulating our climate and how these interactions are adapting with climate change. Daniel Mccoy. (2015). Tiny sea creatures are making clouds over the Southern Ocean. Science. The next time you smell the ocean breeze, thank the algae! Emily McDermith is a University of Rhode Island student in Bigelow Laboratory for Ocean Science’s Research Experience for Undergraduates program. This intensive experience provides an immersion in ocean research with an emphasis on hands-on, state-of-the-art methods and technologies.